I was trying to update a new blog address for someone on my list that changed their blog site and what do I end up doing? Erasing ALL of my blog list instead of just the ONE that I wanted to. UGH!! Thankfully, I had written down (on paper) some time ago all the addresses in case something like this were to happen. HOWEVER, I hadn't updated my paper in awhile and I had added a few since. SO, if yours is not on my blog list or you recognize one that may be missing, please comment me and let me know about it. I'll be sad to know that someone could be missing. Today I did the UNTHINKABLE too. I ventured out (ON MY OWN) with THREE little girls (Rachel-8, Madeline-5, Macy-2)to Grapevine Mills Mall. We were gone for FIVE hours. I must say the girls were VERY good for the most part. I bribed them with getting to ride the carousel and getting to pick out a new outfit for one of their Build a Bears. It worked...HA!! We had a good time, just the girls. Please keep praying for me. I'm still not feeling well. I will feel fine about mid-morning and then by late afternoon I feel AWFUL again. I'm hoping I can shake this off soon. I want to go see my niece but not until I am 100% better. I have an appointment with my doctor on Wed. but it was an appointment to talk to her about my back/shoulder. I guess I will be discussing this sinus yuck too. Is everyone ready for the SUPER BOWL? Who are you cheering for? I'm going with the Arizona Cardinals. Have a great rest of your weekend. Remember let me know if I've forgotten you or someone else on my list. The title describes my life this week. Hence the lack of blogging. However, when my dad asks, "When are you going to update your blog? ", I know it must be time. I haven't been feeling just real good lately. I have been suffering from what I believe is a NASTY sinus infection. My poor head feels like it could explode at any minute. Today, I finally felt well enough to get out and run a few errands that I needed to do. We did have some yucky weather come through on Tuesday evening. It brought with it freezing rain and some sleet. Nothing near what they got in Oklahoma and Arkansas. They closed schools on Wednesday, which Madeline was excited about. Not so much, momma. Macy is feeling much better too. We have a follow up appoitment on Monday to make sure the ear infection is gone. She was so sad when I told her that she was done taking her medicine on Wednesday. She reminded me most every night that it was time to take her medicine. What a good girl. Some of our friends called me on Wed. afternoon to ask if we could dog sit their dog, Maggie. They had to go to Oklahoma because her dad was having an emergency double bypass surgery. (He did well) They moved her a little over a year ago from Alaska (military family). I have known them since 2000. Anyways, when they were in the process of moving here they sent Maggie to live with us for 6 weeks while they took care of all the last minute stuff in AK and then started the trek to Texas. We love having Maggie here. Her and Riley are buddies (sometimes a little too close if you get my drift) Thank God both are fixed. So we have been a family with two dogs again for a few days. Many have asked about how my dad is doing and I'm happy to report that he got his staples taken out yesterday and his shoulder is healing wonderfully. Thanks for the prayers and well wishes. He goes to the Cardiologist next week for the blood pressure issues he's been having so hopefully soon we will get that problem resolved. My new niece I hear is doing AWESOME. Mom says she is one of the best babies. She is sleeping well, eating, pooping, and just being plain cute. I am dying to see her. I think in a few weeks we are going to have to make a trip to OKC to see her. I want to kiss her so bad. 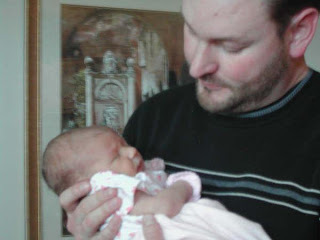 Here she is with her daddy (my brother). He's so in love. She looks just like my brother here. Lyric and Mommy. Jaime already looks amazing. Also, have you been following Baby Harper and Brayden? Isn't it amazing how God is working in both those young lives. GOD is good and does good. Praise HIM!! So that is our life in a nut shell this week. I don't know what she is doing but she yelled for me to come take her picture. HA! Love the outfit. Check out those eyelashes...I wish I had half of them and that mine were half as long. Just beautiful. Sweet sisters with the hats Nana and Papa got them while in Coronado, CA. *Warning, there are LOTS of pictures." With each of these pictures....I had THOUSANDS of things going through my head. Let me try to explain each scenario. The infamous Lemonade stand that Madeline and her best friend has been begging us to have for TWO YEARS!! I'm thinking inside....This is going to be a lot of work, who's going to buy it on a FRIDAY afternoon, I'm going to have to clean up the mess, etc, etc, etc. Well, the girls had the best time and it really wasn't much work. They sold it for .25 and ended up making around $8.00 in about 1.5 hours. Thank God for generous people who love children and tip well....HA! They had a blast and can't wait for the next one. They ask us everyday still to have a lemonade stand. This is how we found Macy on the couch at our neighbors during one of our Friday night game nights. See, most Friday nights we cook dinner, eat together as families, the kids play, and the adults play cards/Mexican train/sequence/etc. This night Macy was trying her hardest to stay awake but just couldn't do it. They are so sweet, innocent, loving, QUIET, when they are asleep. I love to just sit and watch them sleep so peacefully. She thought she'd give me this SWEET face and everything would be right with the world again and well.......IT WAS!!! Just got bit by an ant....I'M DONE!!! Now that is WORTH A THOUSAND WORDS!!! She's going to kill me for this one day. I love how dramatic and into it she is....LOVE IT!! My first niece was born today at 2:08 pm. She is just beautiful. She weighed 6lbs 11 oz. and was 20.5 in long. She has a little bit of short hair and she has my brothers dimples, says my mom. It's hard to be here and hear all the excitement in their voices and not be there to share in it with them. I plan on going to OKC in a few weeks when things settle down and get my love on.. CONGRATULATIONS Aaron and Jaime!! 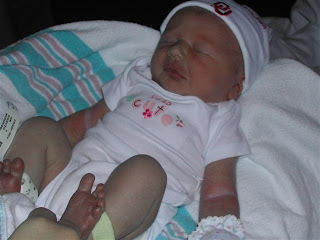 Just a few hours old and momma already has her dressed. Daddy and his little girl. He's already wrapped around her little finger. Beautiful Mommy and Lyric. How can you look so good after just giving birth? You are amazing, Jaime. I think mommy is in love. Today is the day...FINALLY! My niece will be born. By the end of the day, Lyric London will have arrived. Last time I spoke to my parents she was doing well. 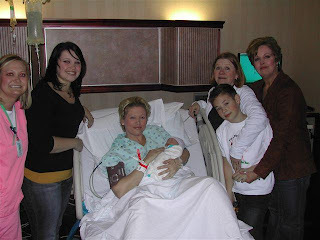 Her contractions were every 3 minutes and lasting about 30 secs. They were about to check her but I haven't heard back. It's killing me that I am not there to see her born. 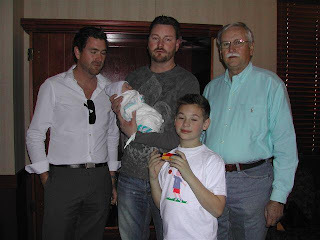 I missed my nephews birth by about 45 mintues as we were in route from Dallas to Tulsa. I told my mom to take LOTS of pics and send them to me TONIGHT. I'm dying to see what she looks like. I'll keep you posted. We're home. We had a great time, as usual in Oklahoma. We got there Thursday evening and found dad in the bed. He was in quite a bit of pain but his face lit up when he saw his girls. Dad is doing surprisingly well. He got to take off his surgery dressings while we were there. We were excited to see the 3 stitches that he got from the surgery. WRONG!!! He took it off and there was about a 10 inch opening with about 15 staples holding it shut. I think they meant it took 3 INSIDE stitches. HA!! It was pretty cool looking. The girls said he looked like Frankenstein. HA! He'll be able to make a real good story for that scare. I couldn't believe that in my dad's 60 years of life, this was his first broken bone. He goes back to the doctor on the 29th to get the staples out. He actually went to work yesterday. While we were in Oklahoma we spent one afternoon with my older brother, his girlfriend, and her son. The girls LOVE Garrett and always enjoy getting to play with him. Jaime was pretty miserable. We were all hoping that she would have my niece while I was there but it just didn't happen. HOWEVER, they got the good news (hence the title of this post) yesterday from her doctor that she will be induced on Thursday. YIPPEE!! 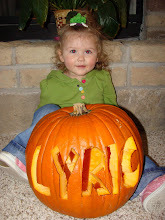 So that means, as of this Thursday I will have a new niece, Lyric London Caldwell. We are all SO EXCITED to meet her. Please be in pray that everything goes smoothly and quickly. Pray for good health for both Jaime and Lyric. 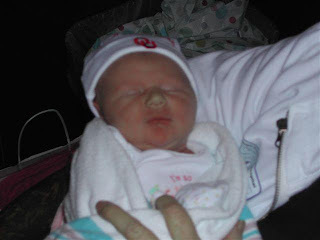 I guess I'll be making another trip to Oklahoma soon to see my new niece. Luckily it's not too far of a drive. While in Oklahoma I came down with a yucky cold, as did Macy. She woke up from her nap on Sat. afternoon with a yucky croupy cough. By yesterday, she began running a fever and sounding even worse. I called the doctor and they were able to get us in with the evening doctor at 5:45 last night. Much to my surprise, Macy has a pretty bad ear infection. I had no idea. She never complained about her ear hurting. The doctor said she didn't see her tubes anymore so they have fallen out. I hope this isn't the start of what we went through in 07. It will be a year this week that she got the tubes put in. Please pray that this is a one time occurrence and not something that is going to continue to happen. She hasn't been sleeping well at night. She tosses and turns most the night. Poor baby girl! 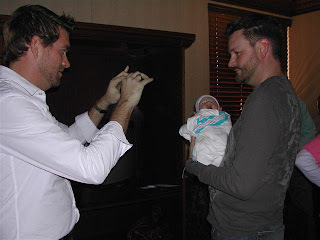 My sister in law and brother in law got to see their baby for the first time yesterday. There was only one baby...HA! She is 8 weeks along. I can't wait to have another little niece or nephew running around. My mother in law and I were talking at Christmas that this time next year we'd have a 6, 3, 2, and 3.5 month old. Crazy, but so much fun. I need to get to the laundry and house cleaning since I have been gone for so long. Please continue to lift up Baby Harper and Baby Brayden. They are in for a long road to recovery but are already showing slight improvements. Our God can heal. Sorry no pictures..I forgot my camera this weekend. Two of my "bloggy friends" had babies within the past two days. Both need URGENT prayers for the precious babies, Harper and Brayden. (click on their names to read about their stories and to get updates). I'm asking for you all to be in prayer for these two families. Even though I don't "know" them personally I have been following their blogs from the day they announced they were pregnant. Both couples struggled with even getting pregnant. They both seem like such amazing couples who love our God and are REALLY leaning on him right now. First, I wanted to thank all of you for your kind words about yesterdays post. I found myself in a "funk" all day. I battled a horrible headache all day. By the evening, I started to feel better and "pep up". However, I think I cried at EVERYTHING last night on the Biggest Loser. Do you watch that show? I LOVE IT!! I was so sad though with the ending last night. I won't ruin it for those of you who may have dvr'd it. Let's just day it was not the way I wanted it to go. Today is my dad's surgery to repair the collar bone that he shattered. He goes into surgery at 11:30. It was supposed to be at 9:30 but when they got there they were informed that it had been pushed back to 11:30. He, nor my mom, was very happy. Especially dad because he hasn't been able to eat anything and you all know how men get when they are hungry. HA!! They are supposed to be putting a metal plate in the shoulder to hold it together. He's hoping that once they get it stabilized he will start to feel better. Right now, it hurts him anytime he moves. I'm still trying to decide if the girls and I will go to Oklahoma. I know dad would love to see his girls, but I don't want them (their noise) to stress him out. HA!! Today after Macy's swim class her teacher told me that she wants to move her up to the next level because she feels that the class she is in right now is not challenging her enough. She is a little fish. She can swim the entire length of the pool (side to side) by herself underwater. I can't wait to see her this summer in the pool. Every time I hear this song by Watermark, (take a second to listen to it) I think of this very day. It describes EXACTLY how I feel. 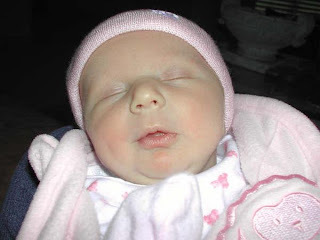 It was 4 years ago on this day that I lost our second child through a miscarriage at 12weeks. I still miss that baby every day. January 13th is a day that never goes without remembering what happened that evening. God decided at that moment that he needed that precious baby, that he chose for us, to come back home in Heaven with him. I'll never understand why but I find peace in knowing that HE was with me through it all. Although I only had you inside me for 12 short weeks, I loved you from the start. We already had plans for you. We already dreamed what you would look like and what you would be like. Even though we never got to see you, hold you, smell you, we LOVED you and continue to today. I got a new bracelet for Christmas and on it is a sweet angel, YOU. Each time I wear it I have a little bit of you with me. That makes me happy. This Christmas while I was at your Papa and Nana's house I pulled out your picture and looked at you. You looked like a little peanut. You were a little peanut. We miss you and love you still. I can't wait for the day when we will see you again. Till then....have fun with Jesus. They went to see the Trauma Orthopedic doctor today and he will be having surgery tomorrow (time still unknown). It looks like they are going to be putting a plate in his shoulder to hold it together. He is still in a lot of pain. We also heard back on one of the tests he had done and it showed "something irregular". He will be seeing the Cardiologist on the 27th. 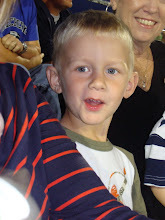 Please be in prayer for his surgery tomorrow and also for the "something irregular". A crash and a visit to the ER!! Last night as I am about to leave for church my mom calls to tell me that she is in the ER with my dad. My heart flip flops, the blood all rushes to my head, and I get a sick feeling in my stomach. My first thought is that he has had a stroke or heart attack because of the high blood pressure issues he's been having. Apparently, he was in an accident. A 4 wheeler accident. We all know that my dad just turned 60 in November. However, he still rides his 4 wheeler like he's 20. I know, cool dad and he is VERY cool....BUT....look what happens. Thank GOD he had his helmet on or who knows what would have happened to him. He was riding down a hill (I'm sure at a very high rate of speed, knowing him) and hit a stump that was sticking up out of the ground when the 4 wheeler threw him off the front and then it rolled over the top of him. He ended up breaking his collar bone in THREE places and getting a severe subdural hematoma on his hip. They thought originally that the muscle may have been torn away from his hip. Thank God it wasn't. I'm sure there are a few more bruises/scrapes/scratches. He was in quite a bit of pain my mom said. They are going to meet with the Orthopedic Doctor today to see if his collar bone will need surgery. Please be in prayer for him and my mom. Him for the pain and my mom for him being a pain...HA!! I love you dad and wish I could be there to give you a hug. Your girlie's send their love too. *UPDATE* Mom just called and they are back from the doctor and he said he has shattered the collar bone and has referred them to a trauma orthopedic surgeon. They have an appt. in the morning. We have 4 days AND COUNTING until we are DONE with Phase 1 of the South Beach diet. We are both still doing well on it. I have lost 8 pounds and Hubs has lost 12 (that was yesterday's weight) I'm sure there was more today. YAY!! We are looking forward to Phase 2 and getting to add a starch and some fruit. We can't wait!!! Many are still asking also about my dad's tests from last Monday. We still haven't heard anything. My mom was not a happy camper. When she called the Dr. office on Friday the nurse said it could be another week until they hear anything. My mom asked what she was supposed to do in the meantime about the extreme high blood pressure. The nurse asked what his blood pressure was and mom told her. The nurse proceeded to say, "He needs to go to the ER"....DUH!! Why do you think we have been running all these tests, genius. Sorry, but Dr. offices drive me crazy sometimes. Hopefully we'll hear something this week. Be in prayer still. I have another prayer request. My friend, Jami, found out over the weekend that her mother has a VERY rare, incurable plasma blood cancer. They will find out more on Tues. when she sees the Oncologist. This will be a very hard battle to fight for this family but with others praying and God in control it will make it easier. Let's see what else....Oh, we got to have a date night Saturday night. We had a yummy dinner (low carb, high protein) and then went to the movie and saw Marley and Me. I loved it. Of course, I cried and cried. Not a good movie to see when you have just lost your dog yourself. It was so good though. It was nice to get out and have a date with my hubby. I hear the weather is supposed to get REALLY cold the end of the week.....YUCK!! Still no niece....She's hanging tight for now. Jaime goes to the Dr. this morning so hopefully we will get some new news. I really want her to come this week so we can go this weekend and see her. Yesterday, marked one week that Hubs and I have been on the South Beach diet. First I want to say, I am SO PROUD of both of us. It's not the easiest of diets to be on. However, I have lost 7 pounds in a week and Hubs has lost 9 pounds. YAY for us!! We have ONE MORE WEEK on phase one and then it will get a little bit easier. In phase two you can start adding fruits, 1 piece of bread a day, several other veggies, cereals, and a few other things. I must say after this next week I don't think I will touch another egg for a LONG TIME. Pretty much all you can have for breakfast in the first phase is eggs, bacon, Canadian bacon, and sausage. I know you are thinking, "that all sounds great." NOT when you are having to eat it for FOURTEEN days straight. It gets REAL OLD. I'll be happy when I can have a grapefruit or a banana. HA! Keep the prayers up for us. This is really important to us to get healthier. In other news, Jaime still hasn't gone into complete labor. 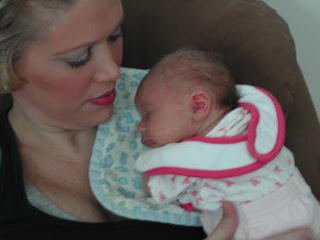 She is not feeling very good so hopefully soon (before next weekend) she will have my niece, Lyric. Those of you that have ever been pregnant know how miserable feeling you are in those last days and how ready you are to meet that precious new baby. If she comes before next weekend, like we are hoping, the girls and I will be traveling to Oklahoma to see them. Last night as we are watching the OU vs. Florida championship game (sorry SOONER FANS) Madeline came to me saying her earrings hurt (left ear). She says it feels like the earring is all the way in her ear. I'm thinking she's just wanting to change out her earrings. I tell her to go get all the "stuff"(peroxide, neosporin, cotton balls) to clean her ears and go pick out some new earrings. She gathers all the stuff and we get on the couch and I began to try to take the backs off the earrings on her left ear when "OH MY GOODNESS" !!! I try not to freak out because I know it will scare her. But I can't believe what I am seeing. First these earrings have two backs on them. The normal silver back and a rubber clear one to keep the silver one from falling off. I get the rubber one off when I CAN"T FIND THE SILVER ONE... After a little investigation I notice that the back is IN her ear. Somehow the back was working it's way into her lobe. I'm able to work it out a little and mean LITTLE. So I go to the other ear and see what the status is there. It's in a little bit not near as bad as the left ear. I get that one out with just a little work. We clean that ear good and move back to the left ear. I try and try to work it back out but of course, Madeline, is freaking out. I decide I need backup. I call my trusty neighbor, Kristie, who also happens to be a nurse. She came right over and assessed the situation. She says, "I've never seen anything like this." We look at it and begin to prepare for "surgery". I'm the "assistant" I hold the flashlight, the q-tips to clean with, and hand her tweezers. Madeline does SO MUCH better with Kristie working on her ear than me. She didn't make one peep with her. I knew that would be the case. After about 10 minutes or so working we finally get the back out of her ear. I will spare you all the icky details but lets just day it wasn't easy getting it out. We cleaned her ears real good and left the earrings out. We've decided that we will be leaving the earrings off for a few days letting the ears heal. I can also say that Madeline will NO LONGER sleep in her earrings. That's the excitement around our house. We've hoping to go to the movies tomorrow night to see Marley and Me. Our babysitter, my neighbors 16 year old daughter, is on the varsity soccer team this year so she has tournaments all weekend. We've hoping she will be through with her games in time for us to go to the movies. I've heard the movie is so good. I read the books right after it came out and LOVED it. I can't wait to see the movie. Also, I have a "blog friend" Amy, whom I've never met but would LOVE to, who has been struggling with infertility. Her mom is doing something very special for Amy and her husband, DW, *Dusty*. Instead of explaining it all to you, you can read about what she is doing HERE. If you would like to help I know they would be so appreciative. They are such incredible Christian people, who love OUR LORD!! I will be helping so can you. Thank you!! I leave you with my two DIVAS!!!!! They are Hannah Montana here. Can't you tell? Thanks Nana for the wig. It gets used A LOT!! If you read my blog I'd love to know about it, click to follow me on the right side of my page. I'd love to read your blog too if I don't already. Thanks for coming by. What was the exciting news? No, it's not what all you thought. I am NOT pregnant. I never understood why everyone always thinks that when I say I have exciting news they think I'm always pregnant. It's not like I've been pregnant like a whole lot or anything. I mean, I know that is very exciting news...but no I AM NOT PREGNANT!! HOWEVER, my sister in law is. That's right, I am going to be an aunt AGAIN! Hub's younger sister, Michelle and her husband, Brad are expecting. They told us Christmas morning and of course, we were all SUPER EXCITED. They put this little note in a gift bag for my mother in law to open. Of course, when she opened and read it she immediately started to cry. Which then I turned to her and said, "Are you pregnant!" YAY!! They had just found out that morning. We are so happy for you guys. I couldn't tell anyone because even though she took TWO pregnancy test and both showed up positive she still wanted to FOR SURE from the doctor. I can't wait to start shopping again. Oh wait, I already have. I already bought the baby it's first outfit. It is SO CUTE!! In other news, my mom just called to tell me that my brother and his girlfriend are at the hospital right now. Jaime has been having some contractions this morning and afternoon. They checked her a little while ago and she was at 3 cm dilated. They are going to check her again in a bit and if she is still progressing they will go ahead and admit her which means hopefully REAL SOON my precious niece will be here. Please say a prayer for them all that everything goes smoothly. She had a hard time with her first child during birth. I'll be sure to post when I hear something else. Jaime was sent home from the hospital. Apparently her contractions slowed and she was not dilating very quickly. I'm sure she is totally bummed. However, with babies, you just never know what will happen. Please keep her in your prayers. My brother said she was in quite a bit of pain. Of course, my brother would rather her hold off until Friday because of OU being in the National Championship game tomorrow night. He is a HUGE OU fan. First I want to thank each of you for your prayers. As of this moment here is the information I have to give you for each prayer request mentioned. 1.My dad had his testing done yesterday but we have not heard anything back yet from the cardiologist. (I hope he doesn't mind me putting his issues on my blog...sorry if you do dad, but I believe prayer works). I'll keep you posted. 2.My neighbor had all her testing done yesterday and passed all with flying colors. However, I feel that there is SOMETHING going on with her body. She has too many "symptoms" for it to be nothing. She is now complaining that anytime she focuses in on something (like to read) she get a VERY Sharp pain behind her eye and an instant headache. I told her she needs to get to a doctor and have that looked at. Please continue to be in prayer for her health. As for Hubs and I, we are still trucking right along with our WONDERFUL (filled with sarcasm) diet. However, I have lost a total of 4 pounds and he has lost 6 (I think, it could be more). So we are still seeing the numbers going down. YAY!! *CORRECTION* I just spoke with Hubs and he has lost SEVEN pounds. Way to go!! That's in just 5 days. Continue to keep everyone in your prayers. We appreciate it. I wanted to ask each of you to be in prayer for a couple of things as we start this week (FREEZING I MIGHT ADD). 1. My dad. He has been struggling with SEVERE high blood pressure for several weeks now. Even on medication for it it still remains VERY high. He has had several tests ran already and all have came back normal. Today he is having an echo cardiogram done. I pray that it will show something that could be causing this high blood pressure. I pray that if it does show something it is something that can be fixed easily. 2. My best friend/neighbor, Kristie D. has been battling with an irregular heart rhythm for a few weeks. She ended up going to the ER this past Friday. They did a few tests there and set her up to meet with a Cardiologist this morning to have a stress test and Echo cardiogram done as well. I pray that they too find something that is causing her to have this uncomfortable and scary episodes. 3. My brother and his girlfriend, Jaime, have an ultrasound today to look at my niece and figure out how big she is and try to figure out a plan on to when she will be born. We are all so excited to meet her. We had a pretty lazy and relaxing weekend around our house. We had beautiful weather (80's) and today we are back below FREEZING!! It's no wonder we all get sick. UGH!! I'll keep you all updated on the above mentioned prayer requests. On the diet front we are still doing good. Hubs has lost a total of 5.2 pounds. I have lost 3 pounds. I am so proud of Hubs too, dieting is not fun and no one likes to do it. However, he is sticking with it. I'll keep you posted. No, I'm not talking about some BEAUTIFUL, EXOTIC beach location. I'm talking about the dreaded........DIET. Our neighbors started on the diet back in August and lost incredible amounts of weight. We've been wanting to do it but haven't braved PHASE ONE of the diet. For those of you who don't know what the diet is. Here is the South Beach diet phase one. We started it on New Years Day. Phase One was in full force. What you need to understand is that Hub's is a VERY PICKY eater. There are VERY FEW veggies that he likes. Most of the ones he likes, you can't eat in Phase One. I'm very proud of him for doing this diet. We both need to live healthier lives. Pray that we can keep it up. We have to be on Phase One (the hardest phase) for 2 weeks. Say a prayer for us please. So far I have lost 2 pounds. Good start. It makes it worth all the suffering (ha) when you see the numbers dropping on the scales. Today marks my one year "Blogger" Anniversary. I started my blog on this day last year. It has been a year of ups and downs. I laughed when I looked back at my blog on this date last year and saw just how much the girls have changed. Take a look. I still can't believe it's already been a year. 2008 went by too fast. Let's recap the year of good and not so good in the Mueller household. We rang in the New Year with our wonderful friends/neighbors The DeCordova's. The rest of the month was hard on me. January 13th marked 3 years since I lost (miscarried) are second child. January 16th marked 1 year since my grandmother passed away. January 25th Macy had surgery to have tubes put into her ears. Although it's only a minor surgery there are always risks and no one likes to see their child hurting. However, it was the best decision we've ever made. Not ONE ear infection since. YAY!! Not much happened this month. I began having a little trouble with my back again this month but nothing too awful. Thank goodness. It was nice to have a quiet stress free month. We had our first "real snow" in Texas. We got more snow this month than we have gotten in the 3 years we have been here. The girls loved it. Macy began to REALLY slow down in her growth over the past few months and so the doctor ordered a number of tests to be ran. Thank God all came back negative or showed nothing. We've decided (for now) she's just going to be petite. We took a family vacation during spring break (with our neighbors) to Galveston. We had a great time and can't wait to go back. The girls loved the beach and Schlitterbaun. However, while we were gone we received a call that a wonderful friend of Hubs' family had passed away VERY UNEXPECTEDLY. We all miss Sue. The biggest event of the month was March 24th. Madeline turned FIVE. I still can't believe it. She had a great party at Let's jump with MANY of her friends. Madeline also got to spend a night with Papa and Nana at the Great Wolf Lodge. That was a lot of fun. We loved the water park. I began the month with physical therapy 3 times a week for my back. Macy chipped her front tooth this month. We get to call her snaggle tooth now. She tripped on her towel after her bath and hit her tooth on the tile. Ouch, I know. We went to the dentist for Macy's front tooth and found out that she chipped it the best possible way. Which in turn means, it shouldn't affect the permanent tooth when it comes in. YAY! I enjoyed working in my flower bed this month. It looked really good this year. If I do say so myself. We celebrated Macy's 2nd birthday this month (the 9th). What happened to my little baby? While in Oklahoma this month I reconnected with one of my dear friends that I hadn't spoken to in over 5 years. (All my fault). All I have to say is that our God is good and thank goodness for true friendships. I also got to see my BESTEST friend in the whole world, Kristie, pregnant for the first time. She was so cute and so small. At the end of the month, Madeline graduated from Pre-K. I have to admit I did cry (just a little). She's all grown up. The girls began enjoying the neighbors pool. I definitely have two little fish in my family. I also had a colonoscopy at the end of the month which again we were blessed showed NOTHING. This month was a very busy month for me. I volunteered at our VBS at church to work with the kindergartners. I worked a full week each night for three hours. That is tiring stuff folks. Madeline swam too much and came down with a bad case of swimmers ear. OUCH! So she had to stay out of the pool for a a week. Trying to keep a fish out of water for a week is hard work. 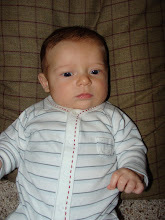 My sweet friends, Chad and Kelly lost their first born child, son, Brayden after he spent 77 days in the NICU. I also threw my best friend, Kristie, a baby shower. We couldn't wait to meet the new baby in a month. Macy said goodbye to her good friend, Binky (pacifier). Let's just say it was way overdue. She did great. We had 2 rough days and she was good. Praise God! My sweet nephew, Austen, celebrated his first birthday. It's hard to believe it's already been a year. 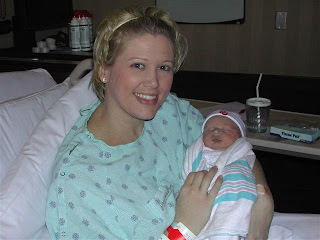 My best friend, Kristie, welcomed her first born son, Tyler on the 21st. He is SO PRECIOUS!! Our beta fish, Dory 2 (Dory 1 died last year) died. Madeline went to Oklahoma and spent a week with Granddad and Gramme. She got to ride home on the train. She thought that was pretty cool. The girls continue to be little fish. The end of the month is hard for me. July 28th was my due date with our second child. I think about them on this date and think what it would be like to have them here. I started this month off with a very fun "Girls trip" with my mom and her sister, Mary. We went to Kansas City and gambled a bit, laughed and ate A LOT. I also got to watch two of my cousins star in their towns' Civic Theatre present High School Musical. They are both SO TALENTED. We had the best time. Ready to go again? I'm ready! Brad and I celebrated 9 years of wedded bliss. I got to meet Baby Tyler for the first time and I fell in love. He is so stinking cute. I could bring him home with me. We spent many nights watching the Summer Olympics together. We took one last trip while we could still use flight benefits to Vegas. I broke my toe right before we left and ended up catching a stomach bug while we were there. However, we still had a great time. The biggest event of this month was Madeline started KINDERGARTEN. Seriously, is she already that old? She loves it. I prayed that she would have a Godly teacher and that is just what she got. We LOVE Mrs. Logsdon. The best part is, she is an OKIE and an OSU alunm. She can't be bad. We also had a Ryker (mom's side) family reunion. It was good to see all the cousins and 2nd cousins. We got to see sweet Baby Tyler again..YAY! We were devastated to learn that Hub's grandfather had passed away. This was a very hard time of the month. He is greatly missed. I began working with the kindergartners on Sunday nights (Kid U). We found out this month that we will be adding a niece. My oldest brother and his INCREDIBLE girlfriend Jaime, are expecting a baby girl. We can't wait to meet her in late January. Hurricane Ike hit our favorite place, Galveston. The beach house we stay in with our neighbors was not completely destroyed but had lots of damage. Macy became FULLY potty trained this month. It only took a few days. She is so good. Life is much easier without diapers. Macy finally started MDO this month after much delay. Life is good for mommy on Tues. and Thurs. HA!! Don't get me wrong I love my girls but a mom needs a break too. I was fortunate to get to attend our church's Women's Retreat which is always SO REFRESHING and UPLIFTING. I know I serve a mighty God who loves me and that is the best feeling. Macy started swim lessons this month. She is doing so well. Madeline celebrated one year of gymnastics and has moved 4 levels in that time. She really has an aptitude for it. Our friends, Jake and Erica gave birth to ONE of the THREE babies Erica was carrying. We met Jake and Erica through some friends of ours and they also happen to be AMAZING photographers. So if you live in my area you MUST look them up here. Our friends, The Murray's gave birth to their son, Adam 5 weeks early. Talk about a sweetie. PRECIOUS!! Madeline got her ears pierced on the 17th and she didn't even cry. The girls both got sick with a HORRIBLE stomach bug the night before Halloween. We didn't get to do much trick or treating this year as both were still very puny. Madeline dressed up as Dorothy from the Wizard of Oz and Macy was Raggedy Ann. Madeline was chosen by her teacher as the STUDENT OF THE MONTH. She received an award at the PTA meeting. We were VERY proud of her. My dad turned 60 on November 7th. Madeline and I made a surprise drive to be at the surprise party my mom threw for him. He was very shocked because we were just in Oklahoma the weekend before. It was worth the 6 hour drive in one day. Our friends, Jake and Erica, lost the twins this month. My heart hurt and still hurts for them. However, they are such AMAZING people. They have remained so strong through all of it. They truly are an inspiration to many. Brad got a new car this month. After 6 years with the Accord it was time to trade it in. He got a Nissan Altima and is loving his new car. We celebrated Thanksgiving in Oklahoma with our families. This month was another tough month as we lost our beloved dog, Buford. We still miss him very much. We've all had a lot of sickness this month too. 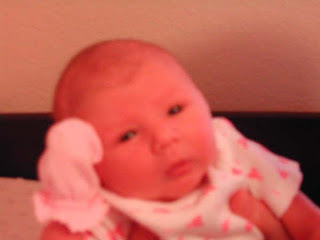 Our friends, The Bateman's had their first baby, a little girl, Katelynn. We're still struggling with illness but beginning to see the light at the end of the tunnel. Thank God. Madeline starred in her first Kids Choir (Kid U) at church. She did so well. My mom and I attempted to make Christmas candy for the first time this year. We did pretty good. I think I gained a few pounds from it. We had a WONDERFUL Christmas with our family and friends. That is our year in review. Busy, crazy, rewarding, chaotic, happy, sad, and wonderful as it was we wouldn't have it any other way. God truly blessed us this year even through the difficult times. We are so blessed. We can't wait to see what is in store for our family in 2009. You just never know. We are excited to see. We wish you all the best and Happy New Year..